The hunters are amongst the woods looking to track down the elusive unicorn, in this detail taken from the original work from the late 15th century. The unicorn was found and killed yet lives again. 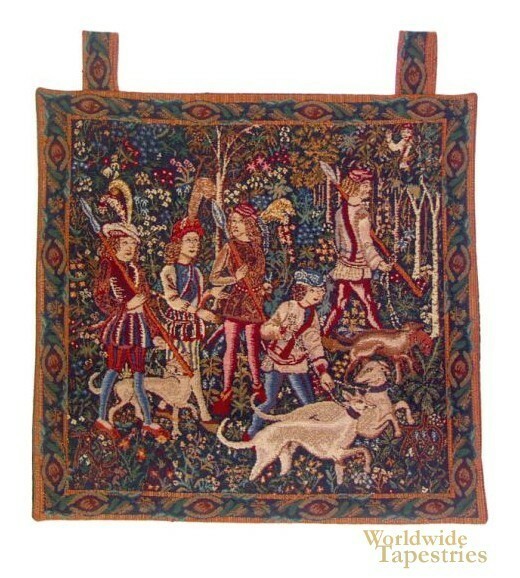 Here the hunters are seen in their colorful attire with their hunting dogs in the lush and colorful forest scene depicted in mille fleur style. This unicorn art tapestry "Unicorn Hunt - with loops" is backed with lining and has loops for easy hanging.